I would say, it was one of the most difficult stages. I wanted to pass YKI last year already (just in case), I was late to get registered for half an hour and then everything was fully booked! Some centers had online registration that required identification through Finnish online bank, some made people queue outside in the morning. What I did was that I used the exam search function at http://www03.oph.fi/kielitutkinnot/. Then I filtered the exam centers that were closest to Helsinki, that did not have complicated online registration (beware of possible technical problems with bank identification and so on!) and where registration started as early as possible on the known date. Wellamo-opisto in Lahti was a best match for me. Registration started at midnight through simple online form and it takes 40 minutes – 1 hour to get there by train from Helsinki. At 8 next morning I confirmed my registration by phone whereas at other exam centres registration started only at 9. Well, I had no time for Finnish language studies. Yes, I speak in Finnish to my colleagues and friends. But I get used to slang and intonations and speaking styles of people I am surrounded by. And I could never motivate myself to sit down and practice tests. Mindmaps. I made a mind-map of the test parts to highlight most probable problems I may encounter. Habit tracker in my bullet journal. I had to set daily goals (read Kauppalehti 15 min/day, listen to podcasts at Supla 20 min/day, read tweets in Finnish and so on). Coordinating with my friends who are planning to pass YKI. Opintopiiri is such a great thing! 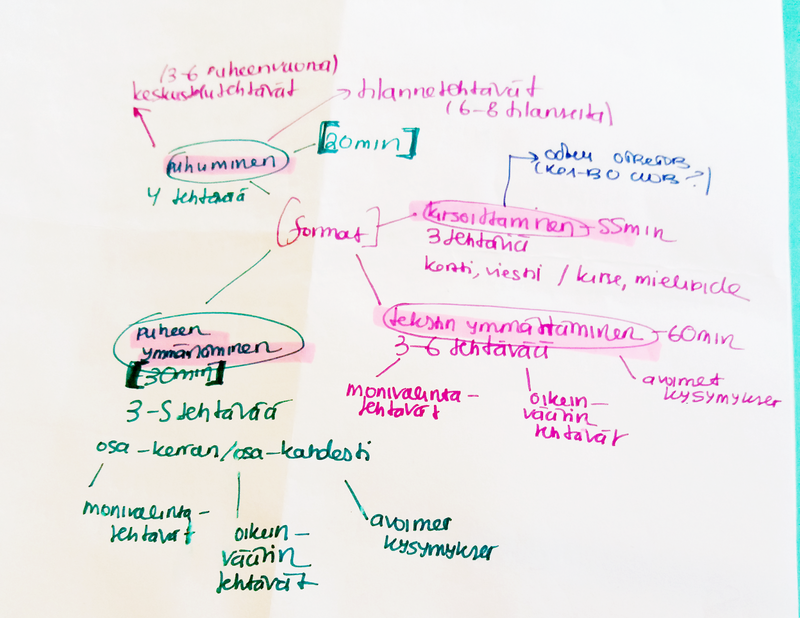 We started with tekstin ymmärtäminen, then we had kirjoittaminen, then after 20 minute break, we went to language studio to do puheen ymmärtäminen and puhuminen. It was good that exam started at 11.30 – I left home at around 8, was in Lahti at 9 and had some time to drink coffee, walk around the city and get relaxed. 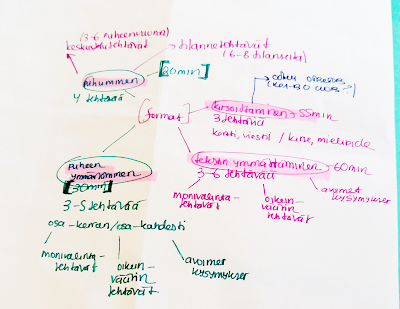 From organizational point of view, puhuminen (speaking) was the most difficult one. I was thinking that I would have to speak in front of a computer with timing shown, but we had our speaking recorded in the old-fashioned language studio (there were 8 of us). I did not train my “intuitional timing” so my strategy was just to talk until the timing stops. Luckily, we had good headphones and I did not hear voices of other examinees talking at the same time with me, just some background “mumbling”. If we speak about question framing, puheen ymmärtäminen (listening) was a challenge. Some recorded speakers had intonations much different from those I hear in my daily life, some questions were framed a bit vaguely. Open questions was an additional challenge because I was trying my best to make my answers look as clear and readable as possible. Even after YKI, I still do not know what would be the best strategy for listening when you have two listening times. Strategy I used at IELTS did not help, because question framing in YKI is a way different thing. Kirjoittaminen (writing) is definitely a challenge for those who have “problems with fantasy”. I heard about after exam as well – some people are struggling about what to write whereas it would be better to start writing anything (as long as it answers the requirements) and take care of grammar constructions and language. We had three tasks: letter to a friend about cancelling a meeting, letter to a shop about defective product and one of two topics for discussion in the internet forum. No one will check whether you are writing to your real friend or whether you actually believe in when writing an opinion essay – please write something and just make sure that it is coherent! And reserve around 10 minutes for proofreading. My personal problem is that when I write I sometimes omit some words and letters just out of hurry (in any languages). So I was really strict in my timing to make sure that I have time to check what I have written. Tekstin ymmärtäminen (reading) was not that difficult. A couple of question were formulated a bit vaguely, but otherwise it was quite easy. I had time to go through all the texts one more time and check vague questions I marked with question mark when answering for the first time. I would say that selection of texts was really diverse and there were no really complicated texts. Just remember to transfer your answers from the questions sheet to answer sheet and you are alright! At 15.42 I was already in my train back to Helsinki. Results come in June – I am waiting for that! P.S. If you feel that you will need YKI only to get citizenship, you are mistaken. If you feel confident about your language skills, spare 120 EUR and time to pass the test on Saturday (in total it takes no more than 4 hours), pass it! You may probably need it for university admissions, proving your language skills for different programs and it is just a fun. In some way. Later, I will reflect on some strategies how to prepare for YKI. Stay updated! Thanks Alexandra for the details about YKI exam. How was your result and were you happy with it? I have exam coming Saturday. Do you have any tips for the writing part? Hi, have you passed the exam?